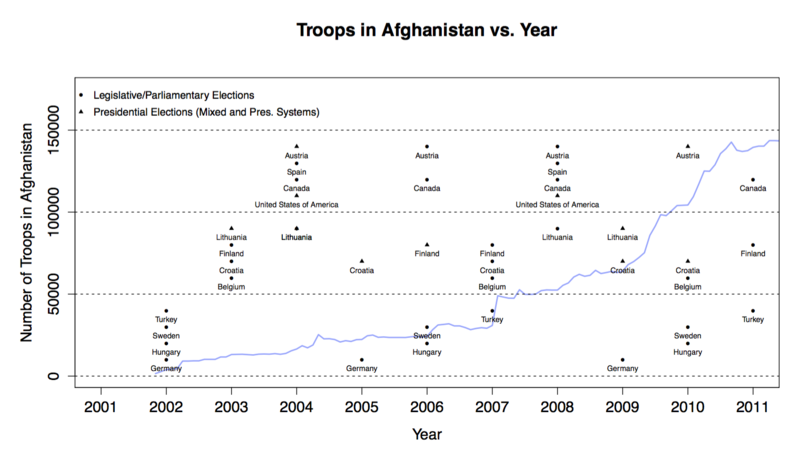 In an important paper, Nicolay Marinov, William G. Nomikos, and Josh Robbins show that democratic countries were less likely to contribute troops to the International Security Assistance Force (ISAF) in Afghanistan. The authors have contributed their data to the ESOC archive on Afghanistan. These data include monthly troop levels by participant nations, a range of public opinion data, and qualitative data for the contributing governments. Taken together this collection provides rich context on the politics in key troop contributing nations, enabling a subtler analysis of how home-country politics influenced or were influenced by the conflict in Afghanistan.